Travel is associated with the 9th house – the house of Wisdom and Higher Mind. The 9th house is also ruled by Jupiter, the planet of growth and expansion. As you leave the details of your usual day-to-day life behind, your mind expands to see the world through ‘Beginners Mind’, in a fresh, new way. In a new place you can dedicate your days to a specific activity such as yoga or healing treatments, free your mind, and connect with your soul. Look for upcoming travel retreat dates to be posted on this page. Contact me HERE if you’re interested and want to be on our travel list. This photo was taken at the Puja , a spiritual ceremony of prayer, song and ritual to connect with the Divine. 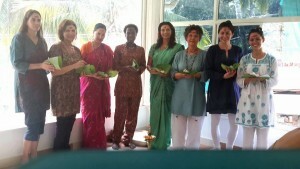 Our 2014 retreat was a week of Ayurvedic healing and yoga at Somatheeram Health Resort in Trivandrum India. We had a week of healing treatments, great food, and daily yoga. Each person met individually with an Ayurvedic physician for an initial consultation to determine her dosha type, so that her treatments would be specific to deliver the highest benefit. The staff and healing treatments at Somatheeram were top notch. We all benefited from two handed massage therapies, personally selected herbal treatments, milk-baths, and more. Ayurveda is a subtle but powerful healing modality, and the health benefits that I gained there continue to grow every day. For this journey we had a group of 8 women, but our trips are not exclusively female, and men are welcome. One of the highlights was a Puja (sacred ceremony) conducted by an Indian holy man. 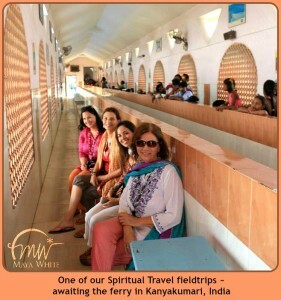 In addition to daily Ayurvedic healing therapies, Maya conducted four days of her Kerala Mystery School. The tradition of Mystery Schools represents a lineage of oral teachings from teacher to student and can be traced back 3,500 years ago to the time of King Solomon. 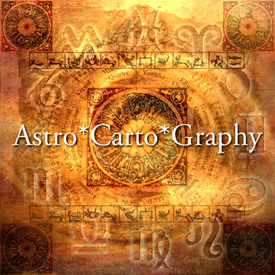 We explored 4 subjects with for an in-depth look at how to apply these teaching to your life: Astrology, Numerology, the Hindu Gods and Goddesses, and Divination. Sunset at the southern most tip of India! 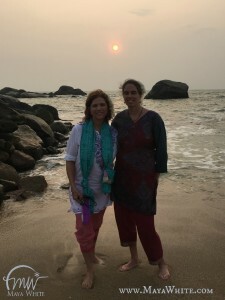 We had plenty of opportunities to visit the local Kerala markets, and our group took a short day-trip to Kanyakumari, an ancient seaport town located at the tip of the continent. Along with others, we celebrated and watched the sun set simultaneously over 3 oceans – the Arabian Sea, the Indian Ocean, and the Bay of Bengal. Kanyakumari is also where the Vivekananda rock temple is found. From very ancient times, the rock has been regarded as sacred place. In Puranic tradition, the Vivekananda site is known as ‘Shripada Parai’: meaning the rock that has been blessed by the touch of Shripada feet of the Goddess. This was a perfect destination for our healing journey. We had wonderful times meeting and interacting with each other as well as the Kerala people. 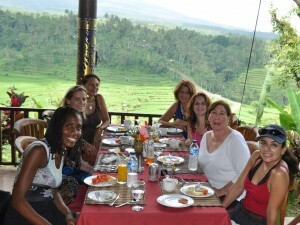 Here are some photos from our 2010 Goddess Retreat in Ubud, Bali. What an amazing culture and land. Bali, a small island to the east of Java, is the home of the last surviving Hindu–Buddhist civilization of Indonesia. The land is lush and beautiful, the people are kind. This was a journey of yoga, fun, and spiritual growth. In Bali, the group worked with our special healer and shaman, Pakmong. Everyone had at least one healing session, and some had several treatments. This retreat was held at Melati Cottages, in Ubud. Melati has a beautiful yoga pagoda, and we had Kundalini yoga sessions led by Fateh each day. We also did several excursions to healing temples and ceremonies. Below is a photo taken at a restaurant overlooking beautiful rice terraces. Our group also visited Goa Gajah, known as ‘the Elephant Cave’ which is where the lovely fountains are found in the other photo here. 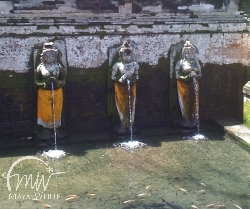 Goa Gajah is a 9th Century sacred bathing place and a UNESCO world heritage site. One of our excursions was a lovely lunch overlooking the rice fields.